Cart wheels were shod with iron bands or hoops, and when a hoop wore out or came loose, it was the smith's job to make another. Cart wheels were measured for their tyres, using a wheel measure rolled round the edge. Then a strip of tyre iron was cut, a fraction of an inch short of the right length to go round it. The amount of this "nip" depended directly on the size of the wheel. This wheel is being measured for re-tyring after a new section of felloe (wooden rim) has been put in place by the wheelwright. Move your mouse over the wheel to point out the measuring tool and the place where the wheel has been mended. The smith heated the iron, rolled it through a machine with three rollers to produce a circle and welded it shut. Then he heated it again to expand it, so it would slip easily onto the wheel. This time it was heated outdoors on a turf or peat fire because it was often too big for the forge to heat it evenly. Cart tyres - all that is left after a wooden cart wheel rots away. These are over 4 feet in diameter. 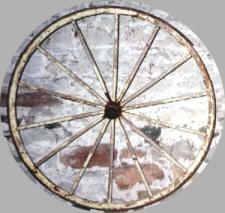 The smith and his assistants put the wooden wheel face down on a big circular metal "hooping plate". The plate was about 6 feet across and it was often sited near a stream; until recently  there was one in a yard near the road at Newton Reigny, Penrith. The men brought the hot tyre quickly from the fire to the hooping plate, carrying it with pincers. Then they cooled the hot tyre with water - poured on quickly from watering cans - to prevent the whole wheel catching fire! As the metal cooled it shrank tightly into place on the wheel. Too much "nip" could wreck a light construction like this gig wheel, so it was a tense time. If the job had been done well, the wheel could go on to give decades more work.